As a librarian, I find it is insufficient to simply espouse equality and equity. I must do more with the knowledge and resources I help to steward. As a librarian, I must advocate for opportunities and social justice for all whom I serve. The implication of that statement is that, when I see systemic barriers to opportunity, systemic denials of social justice, I must advocate for better. I must do better. I must speak out about the inequities and injustices I see working against members of my community, and I must work hard to dismantle them. I cannot merely pay lip service to these ideals. I must commit myself to living them. 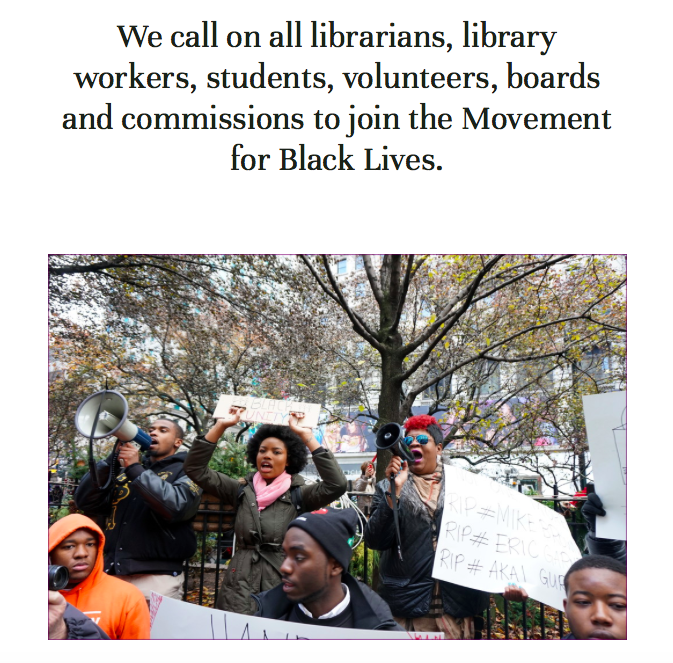 And so I am answering the call to action of #Libraries4BlackLives. I am taking the pledge for the Movement for Black Lives. I am looking to resources curated by the librarians behind #Libraries4BlackLives and crowdsourced by library workers also committed to ensuring that Black lives are afforded the same opportunities and dignities so freely given to others. It may seem that, as a White woman coming from a position of White privilege, I do not have to do these things. On a surface, survival level, our society confirms that is true: no harm or injustice will come to me if I choose to remain quiet. But the Black members of my community will continue to come to harm and experience injustice if I remain quiet, and if all other White library workers remain quiet. Black lives will continue to come to harm and experience injustice because that is the effect of the systemically racist society in which we live and work. It is a moral and professional imperative that I do not remain quiet and do nothing. 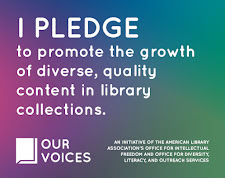 Staying quiet and doing nothing is directly antithetical to the values of libraries to serve and support all members of our communities. Serving and supporting all members means recognizing when voices are systematically marginalized and doing something to address that inequity. I urge you to reflect on your values as a person working in libraries. I urge you to recognize the vital necessity of the Movement for Black Lives, and to explore the resources curated by #Libraries4BlackLives as a starting place for working to do better. I urge you to join in answering the call to action and taking the pledge. Librarianship on YouTube: All the Summer Reading Hype! It's early July, which means we're in the trenches of summer reading. The people! The reading recommendations! The sign-up questions! THE HOARDS OF PEOPLE! It's a glorious time for public libraries, but it can also be overwhelming. Which is why I think S. Bryce Kozla over at Bryce Don't Play is mix of fairy godmother and evil genius for coming up with the idea of asking libraryland folks to make summer reading hype videos for her staff. And she's a benevolent fairy godmother/evil genius for encouraging those of us who made videos (even poorly-shot and frighteningly-edited like mine) to share them with all the people. The goal: assert that, even if it feels like you're drowning under mountains of summer reading swag, 1) YOU ARE NOT ALONE and 2) YOU ARE MAKING A DIFFERENCE. So here's my entry in the summer reading hype video category. The full title, which YouTube seemed not to like because of a pesky thing called a "character limit," is 5 Things Leslie Knope Taught Us That Can Help to Power Through an Amazing Summer Reading Club (or any other big program, initiative, presentation, unity concert, or binder project on your to-do list). I highly recommend looking through Bryce's original post to see all the glorious videos from across libraryland, with new entries being shared weekly. And if you feel inspired to make your own, DO IT! It's strangely cathartic.